We've now seen two different photos of Charlie Cox in his superhero costume for the upcoming Marvel Studios Netflix series Daredevil, but fans have been quick to point out that he hasn't been wearing his classic costume - instead wearing a more ninja-like black number (as seen above). This has had some nervous that we wouldn't be eventually seeing the hero in his classic red suit - but we're ready to put that fear to bed. It would seem that the show will be slowly graduating Daredevil to that point in his superhero career... but he has to start somewhere. 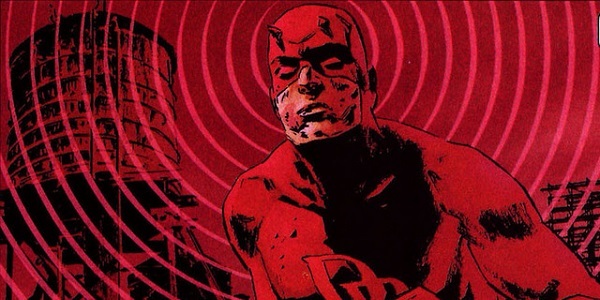 As we explained when the first image from Daredevil was released back in October, the black costume is based on Frank Miller and John Romita Jr.'s work in the Daredevil: Man Without Fear miniseries that was released in 1993 and explored the superhero's origins. In the series, blind New York City lawyer Matt Murdock (Charlie Cox) finds another way to keep justice in the landscape of Hell's Kitchen by training with a sensei named Stick (Scott Glenn) to become a vigilante. Unlike the Marvel film heroes like Iron Man and Captain America, who are regularly dealing with issues that deal with global security, Daredevil will introduce the concept of street-level superheroes to the Marvel Cinematic Universe, and will do so with ties to other street-level characters like Jessica Jones, Luke Cage and Iron Fist (all of whom will also soon be getting their own Netflix shows that will tie into an Avengers-like Defenders miniseries). Buffy The Vampire Slayer/Angel alum Steven S. DeKnight is serving as the showrunner on Daredevil (with the first two episodes written by The Cabin In The Woods' Drew Goddard), and in addition to Charlie Cox and Scott Glenn, the series as a rather stacked cast that also includes Vincent D'onofrio as The Kingpin, Deborah Ann Woll as Karen Page, Elden Henson as Foggy Nelson, Ayelet Zurer as Vanessa Marianna, Vondie Curtis Hall as Ben Urich, Toby Leonard Moore as Wesley, Bob Gunton as Leland Owlsley, and Rosario Dawson as Claire Temple/Night Nurse. Unfortunately, it's currently unknown exactly when we will be getting to see the show for ourselves, but it is expected to drop in 2015, and - like almost all other Netflix shows - will be available for binge-watching the date of its premiere.